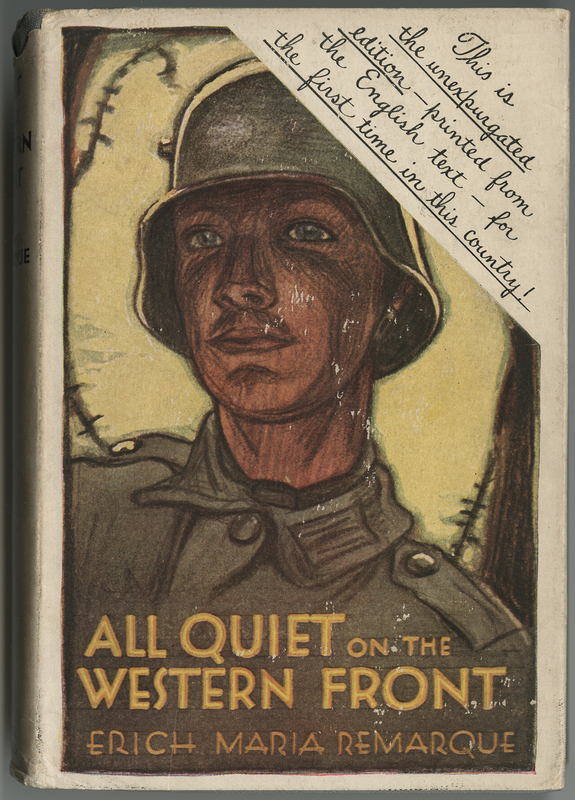 Tomorrow, May 15, the Ransom Center will screen All Quiet on the Western Front (1930), the second film of the World War I Film Series, held in conjunction with the current exhibition, The World at War, 1914–1918. The film will be shown in the Ransom Center’s theater at 7 p.m.
All Quiet on the Western Front, an adaptation of Erich Maria Remarque’s 1929 bestselling novel, tells the story of Paul Baümer, a young German soldier who—under tremendous pressure from his war-enthused village—enlists in the German Army and serves on the battlefields of France and Belgium, where he suffers the demoralizing conditions of trench warfare and is wounded in battle. 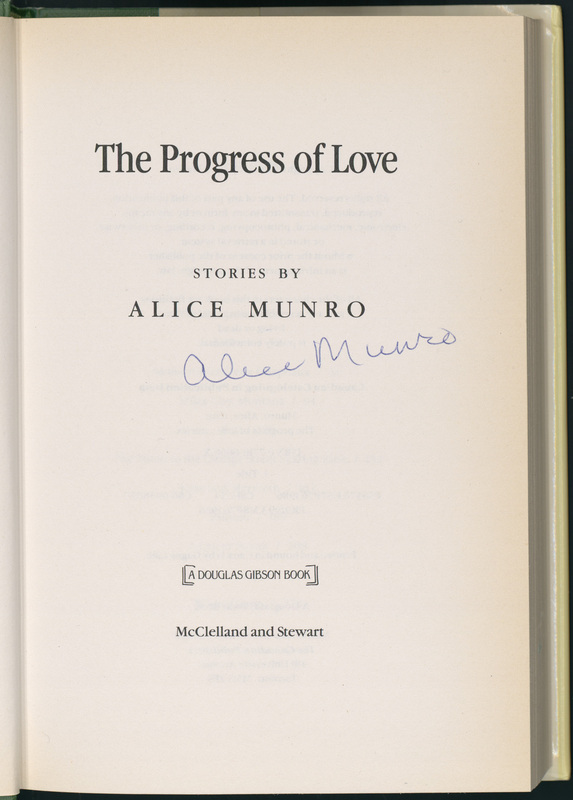 Remarque’s novel is often cited as a landmark in the history of post-WWI disillusionment; its success caused the book market to be flooded with war memoirs and novels written by veterans, many of whom expressed anger and resentment toward former military leaders and insensitive civilians. 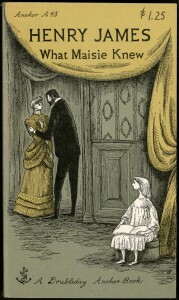 The 1930 film adaptation of the story was every bit as controversial as the book—which was censored and banned both for its “filth” and its anti-war sentiment. The production and reception history of the film quickly established it as one of the most far-reaching and provocative movies ever made about the experiences of men in battle. Though the public controversy surrounding Remarque’s book certainly made for a precarious film adaptation project, the international success of the novel prompted Universal Pictures to buy the production rights on Armistice Day in 1929. Though many at Universal feared that Remarque’s bleak story of war and its horrors would not appeal to audiences a decade after the war’s end, Universal’s founder, Carl Laemmle, himself a committed pacifist, insisted on the creation of the film. After much in-house dithering, Universal selected Lewis Milestone, a Russian-born immigrant who had become a naturalized American citizen in 1919, to direct the film. Milestone had served in the U.S. Army Signal Corps during the First World War, where he had produced army film footage. The original screenplay was edited by a team that included Maxwell Anderson, the author of the WWI stage play What Price Glory?, which had been released as a silent film in 1924 and would later be remade under the direction of John Huston in 1952. Future famed director George Cukor, in his first Hollywood job, was the uncredited dialog director of All Quiet on the Western Front. Milestone and his team had grave difficulty deciding on the cast; more than 200 screen tests were given to a wide variety of actors and actresses. 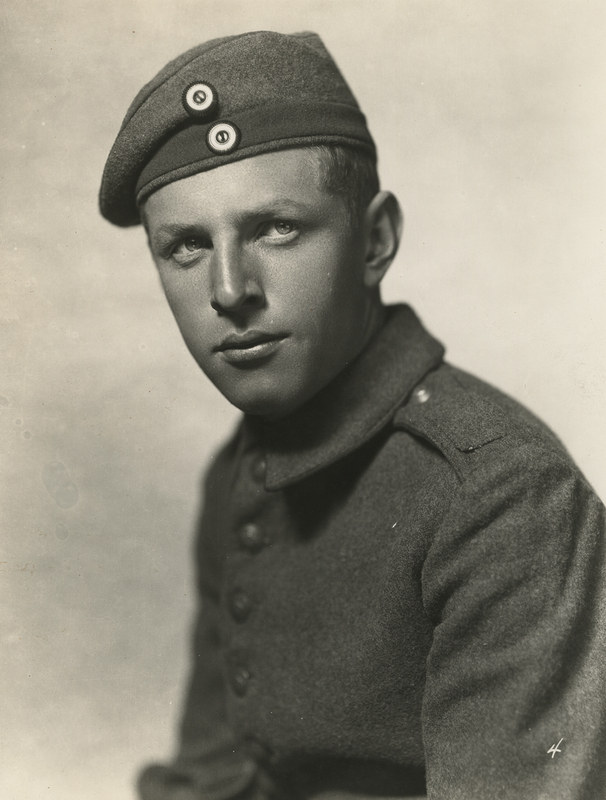 Milestone had the most trouble choosing an actor to play Paul Baümer: should the lead be a known star or an unknown talent, presenting the “everyman” aspect of an infantry soldier? Milestone considered Douglas Fairbanks, Jr., Johnny Harron, and even Erich Maria Remarque himself before settling on the virtually unknown Lew Ayres, whom he came across while looking at screen tests Cukor had discarded. The role of Paul Baümer would become definitive in Ayres’s life and career. While working on the film, Ayres became a dedicated pacifist; years later, when the draft was introduced for World War II, Ayres announced himself a conscientious objector. His decision provoked the ire of Hollywood, and Ayres was blacklisted by many Hollywood producers during wartime. Milestone was dedicated to creating realistic battle scenes for the film: Universal dramatically exceeded its budget on the movie—in all spending nearly $1.5 million on the film, four times more than its initial projection. Milestone created a large-scale reconstruction of a First World War battlefield in Balboa, California, complete with trenches, barbed wire, and a No Man’s Land. A special crane was imported for the camera, and authentic uniforms were imported from France and Germany. Ex-German Army officers were hired to drill the actors. The elaborate sets and nuanced acting of the film brought wide acclaim in America and Britain when it was released in 1930: Variety called it a “harrowing, gruesome, morbid tale of war, so compelling in its realism, bigness and repulsiveness. . . .Nothing passed up for the niceties; nothing glossed over for the women.” The film won the year’s Academy Awards both for best film and best direction. Such accolades did not extend across Europe, however, where many countries objected to the film for its blatant anti-militarist stance, its graphic nature, and its depiction of the former Central Powers. The film was banned in Italy, Hungary, Bulgaria, and Yugoslavia. It incited angry demonstrations in Austria. France did not ban the film but censored a scene in which German soldiers spend the night with French women of questionable morals. As may be expected, the film received the most incendiary reactions in Germany. Though Universal prepared a specially dubbed version of the film, edited by Remarque himself (who cut many of the more overt depictions of German militarism), it caused riots in German theaters. Joseph Goebbels publicly denounced the film, and the leading Nazi newspaper called it “a Jewish lie.” Five days after premiering in Berlin, All Quiet on the Western Front was suppressed by Germany’s Supreme Film Censorship Board. 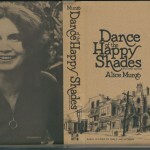 Reels of the film, as well as copies of the book, were publicly burned. Only after several decades would All Quiet appear in full in Germany. In 1984, a dubbed reconstruction of the original cut of the film was broadcast on television in West Germany for the first time and to great success. Nearly 11 million viewers watched the film. The restoration of the film for public view embraced an irony appropriate for a story that criticizes bureaucracy and high command: one of the prints used for the restoration had come from the private collection of noted cinephile and censor Joseph Goebbels, who in the 1930s had burned as many reels of the film as he could, save for his own. Lew Ayres as German private Paul Baümer. 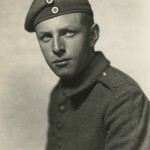 Originally a supporter of the war effort, Baümer returns from the front lines to report that, “It’s dirty and painful to die for your country. When it comes to dying for your country, it’s better not to die at all.” The last scene of the film documents Baümer’s death on a parapet on the Western Front; he is shot while reaching his hand toward a butterfly. Staff members who are working on the Ransom Center’s 2014 centenary exhibition Looking at the First World War have certainly found Sherry’s claim for the importance of Fussell’s influence to be true. Fussell, a former patron of the Ransom Center, centered his work on many of the British trench poets and writers whose manuscript collections are held at the Center. The Great War and Modern Memory frequently refers to the poem drafts, letters, and diaries of writers such as Wilfred Owen, Siegfried Sassoon, and Edmund Blunden. Fussell maintained that these writers—all of whom were young officers in the trenches of the Western Front—developed a new and often satiric poetic language that served to subvert the “official” rhetoric that was used by the British government and army. Combining biting irony with graphic descriptions of newly industrialized warfare—gas attacks and machine guns, for example—the Generation of 1914 sought to tell the public the eyewitness truth about modern combat. Numerous items that will be on display in the upcoming exhibition highlight Fussell’s observation that the First World War, as a watershed moment of the twentieth century, inspired soldier-poets to produce deeply personal accounts of their combat experience—often in direct response to government and army propaganda. One of The Great War and Modern Memory’s most memorable examples of the division between the “official” language of the War and the literary response to trench life is Fussell’s discussion of the standardized “Field Service Postcard” issued by the British Army in November 1914. Known as “Quick Firers,” these postcards were mass-produced in the millions and issued to infantry servicemen who would send them to family and friends as evidence of being alive and safe. 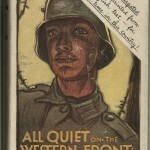 The Ransom Center’s Wilfred Owen collection houses more than a dozen of the Field Service Postcards that the young poet-officer sent his family while on active duty in France during 1916–18. 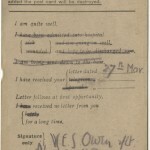 As you can see from this image of a postcard sent by Owen to his mother in 1917, the card forces the sender to report his well-being by choosing between uniform, pre-printed sentences: “NOTHING” written in the margins of the card is allowed, or else the card will be destroyed instead of sent. 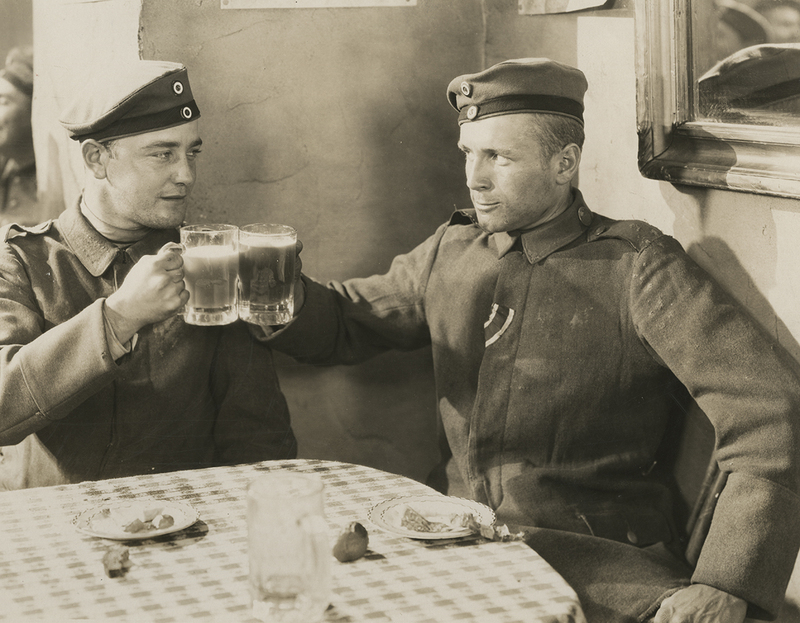 Thus, soldiers such as Owen faced what Fussell refers to as the “implicit optimism” of the Field Service Postcard: they were forced to report that they were “quite well, “going on well,” or were to be “discharged soon” and happily sent back home. The standardized sentences of the card did not allow soldiers to report, for example, that they were facing an artillery barrage, had lost limbs, or were wounded beyond hope of recovery. 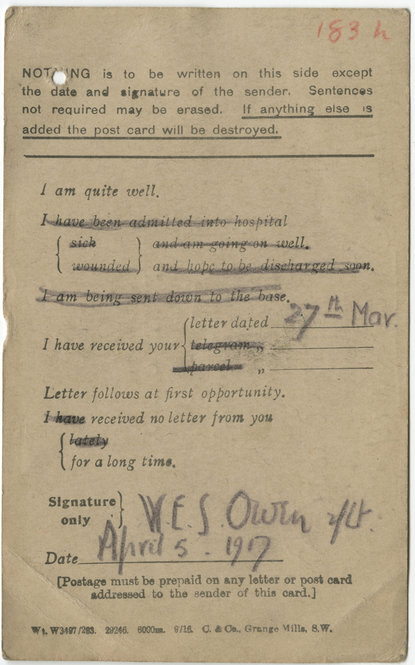 Owen, who detested the army’s censorship, made an agreement with his mother that if he were advancing to the front lines of battle he would send her a Field Service Postcard with the sentence “I am being sent down to base” struck out twice. 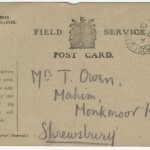 The double strikeout is apparent in this postcard, sent just days before Owen was transferred to the Somme region of France, where he participated in some of the heaviest fighting of the War. In the years following the Great War, the Field Service Postcard, which Fussell calls the first widespread “form” letter, would be spoofed by poets and writers wishing to point out the lack of humanity in these standardized communications. 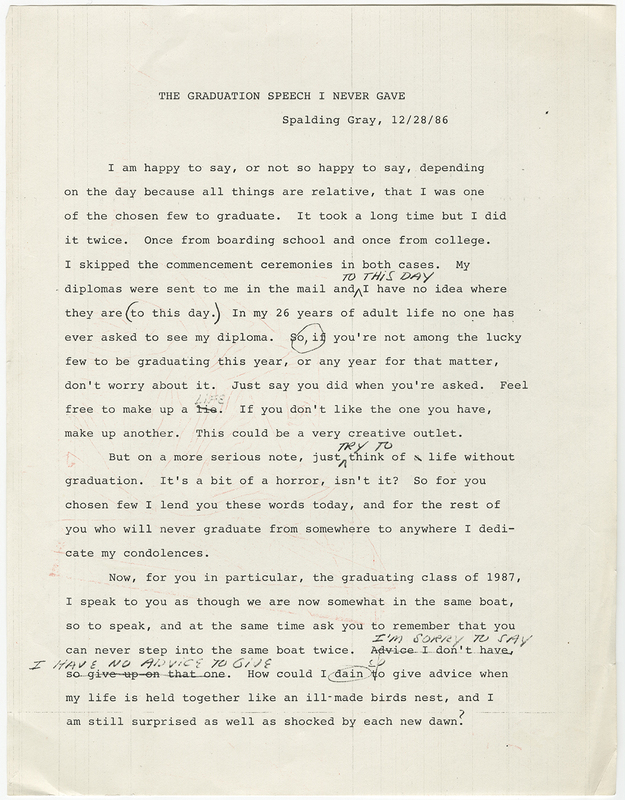 As discussed in a blog post by Rich Oram, the Ransom Center’s Edmund Wilson and Evelyn Waugh archives reveal that both men mocked the “form-letter” model when sending or declining social invitations in the postwar period. 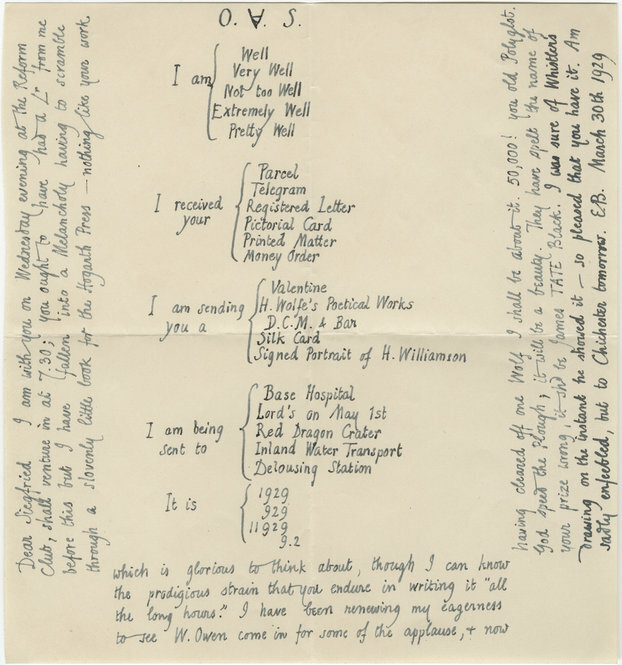 This 1929 letter from the poet Edmund Blunden to Siegfried Sassoon, housed in the Ransom Center’s Siegfried Sassoon collection, demonstrates that the memory of the standard Field Service Postcard stayed with soldiers long after the Armistice. Blunden offers only alternative variations of “well” as a means of describing his mental state and mixes contemporary references with allusions to wartime objects or locations. 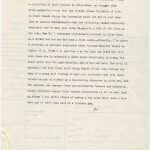 When listing the possible enclosures of the letter, Blunden offers “H. Wolfe’s Poetical Works” or a “Signed Portrait of H. Williamson” (Humbert Wolfe and Henry Williamson were literary rivals of Blunden’s) alongside a “D.C.M. and Bar” (Distinguished Conduct Medal and insignia for a soldier’s uniform) and a “Silk Card” (an embroidered postcard that was often sent as a souvenir by British soldiers in France to their loved ones at home). Likewise Blunden brackets obsolete military destinations—“base hospital,” a “delousing station,” and “Red Dragon Crater” (a section of No Man’s Land where Blunden endured some of his worst combat experience)—with Lord’s, the famous London cricket ground beloved by both Blunden and Sassoon. In personalizing the “form-letter,” Blunden emphasizes the hollow and automated nature of the Field Service Postcard in its original form. As Fussell reminds us, such gestures of individuality were acts of defiance against the industrialization of war, death, and language during the First World War and its aftermath. Paul Fussell’s The Great War and Modern Memory discusses several Great War poets and writers whose archives are housed at the Ransom Center, including Owen, Sassoon, Blunden, Robert Graves, H. M. Tomlinson, and Isaac Rosenberg. Please click the thumbnails to view full-size images. 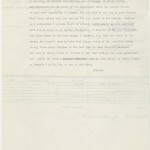 By previous agreement, Owen’s double strikeout of “I am being sent down to base” indicates that he was headed to the front lines of the Western Front. By late 1918, Owen feared that his mother might misread this secret system of communication and worry unduly: on October 29, 1918 he wrote to Susan Owen, “I don’t want to send Field Cards in case you suppose they mean in the Line. In future . . . a F. Card will be no proof that I am actually there.” He assured his mother he was not headed toward battle. A few short hours after writing the letter, his battalion was moved to the front line of the Sambre-Oise Canal, where nine days later he was killed by a German sniper. Owen’s parents received the news of his death on November 11, 1918, the day of the cease-fire. 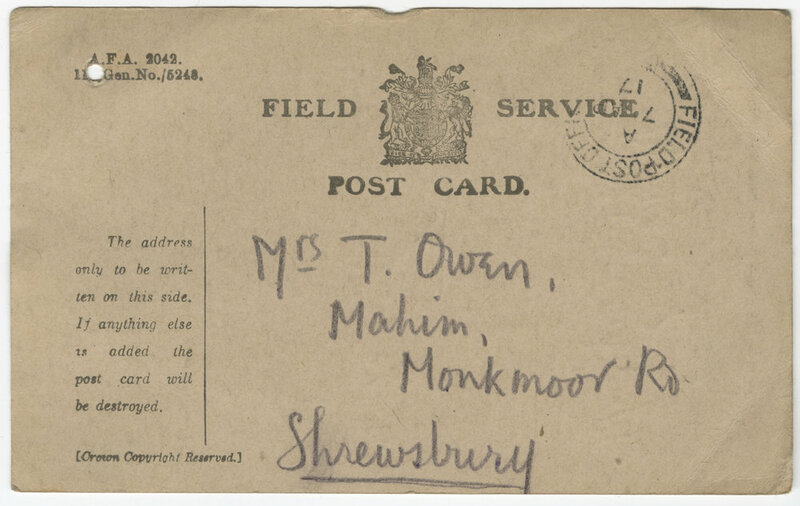 A standard British Army Field Service Postcard sent from Wilfred Owen to his mother, Susan Owen, on April 5, 1917. 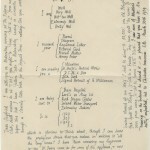 A letter from Edmund Blunden to Siegfried Sassoon, dated March 30, 1929. 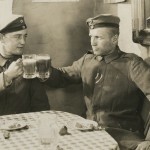 Mixing wartime references with inside jokes, Blunden creates a postwar parody of the standard Field Service Postcard issued by the British Army during 1914–18. Legendary science fiction writer Ray Bradbury, author of the classics Fahrenheit 451 and The Martian Chronicles, died last Wednesday at the age of 91. In his long writing career, Bradbury published hundreds of novels and short stories, becoming an icon in the world of literature that describes aliens, space ships, faraway planets—and the future of books. Like the 13-year-old characters in his Something Wicked This Way Comes, Bradbury spent much of his boyhood visiting the public libraries of his Midwest hometown, where he was inspired by the works of such writes as Aldous Huxley, Jules Verne, and H. G. Wells. Throughout his life he was an enormous supporter of libraries, advocating them as some of the most important institutions in American life and culture. The son of an electrician father and a Swedish immigrant mother, Bradbury lacked the means for a formal college education and prided himself on being largely self-taught. 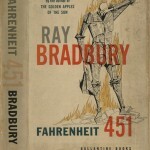 In 1971, in aid of a fundraising effort for public libraries in southern California, he published the essay “How Instead of Being Educated in College, I Was Graduated From Libraries.” Like the characters in his most famous novel, Fahrenheit 451, Bradbury feared a future wherein books would become obsolete. 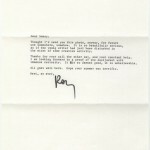 The Ransom Center also houses manuscripts and letters related to Ray Bradbury in its Lloyd W. Currey, Sanora Babb, Eliot Elisofon, Lillian Hellman, B. J. Simmons, and Tim O’Brien archives. 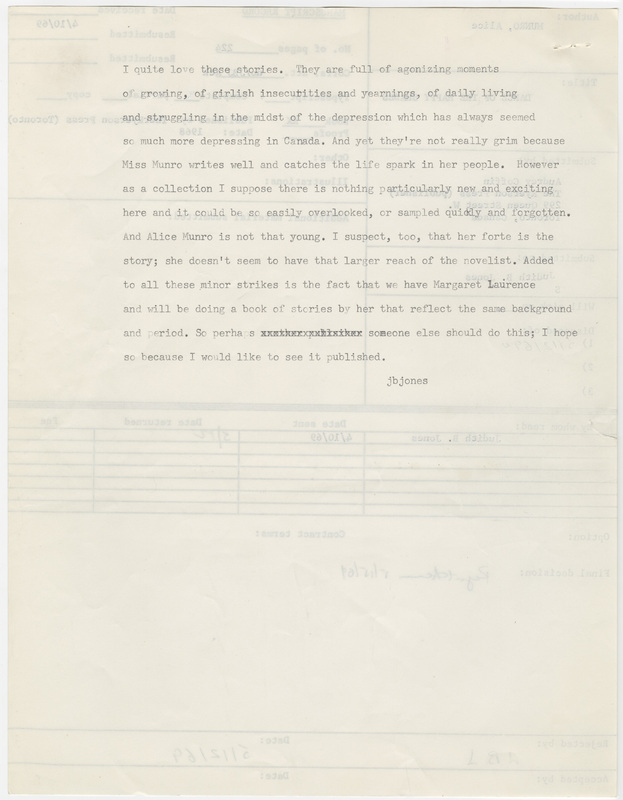 Additionally, the Ransom Center’s Lewis Allen collection contains screenplay drafts, correspondence, casting notes, call sheets, and promotional materials for François Truffaut’s 1966 film adaptation of Fahrenheit 451. “Fahrenheit 451,” Bradbury’s most successful novel, tells the story of futuristic firemen who burn books, believing that printed words fill citizens with contradictory values and threatening ideas. 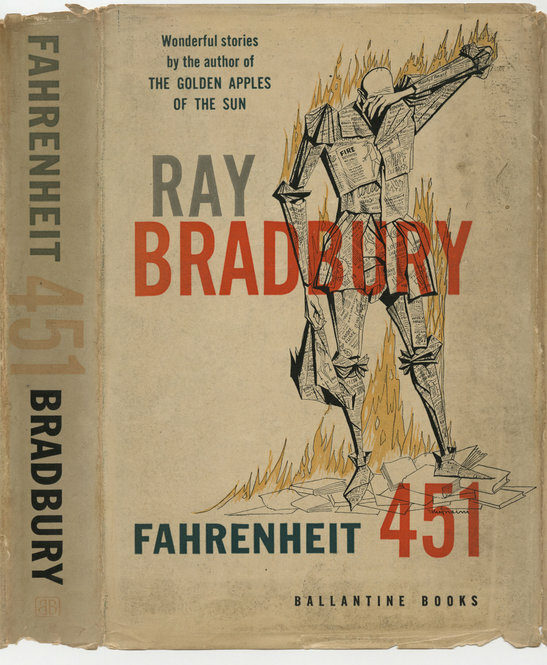 Since its publication the book has been discussed as Bradbury’s most pointed attack on censorship, anti-intellectualism, mass culture, totalitarianism, and the McCarthyism of the 1950s. 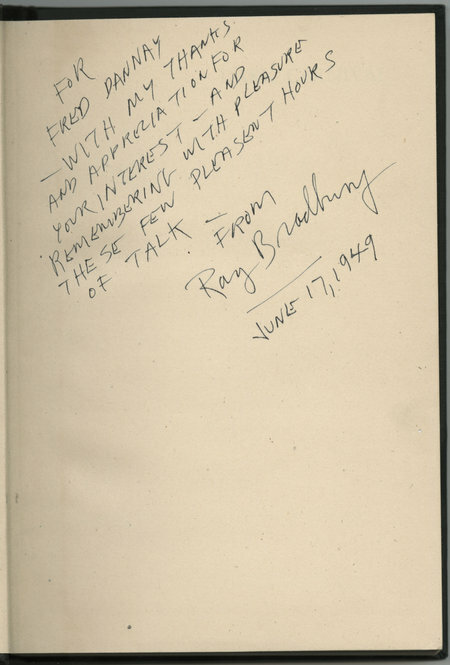 Bradbury inscribed this first edition of “Fahrenheit 451” to Rita Smith, a New York fiction editor who was also the sister of Carson McCullers. In the 1940s Smith was an editor at “Mademoiselle” magazine. 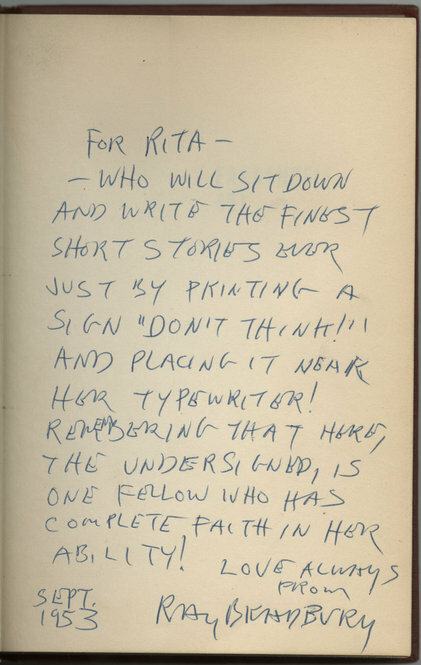 A young staff member, Truman Capote, found one of Bradbury’s short stories in the magazine’s slush pile of submissions and recommended it to Smith, who advocated its publication and became a lifelong friend of Bradbury’s. François Truffaut, Julie Christie, and Oskar Werner on the set of “Fahrenheit 451” (1966). 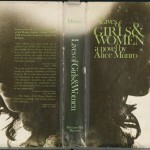 Lewis Allen collection. Though rejected by the firm Alfred A. Knopf early in his career, Bradbury would become one of the publishing house’s highly valued authors in the 1970s. 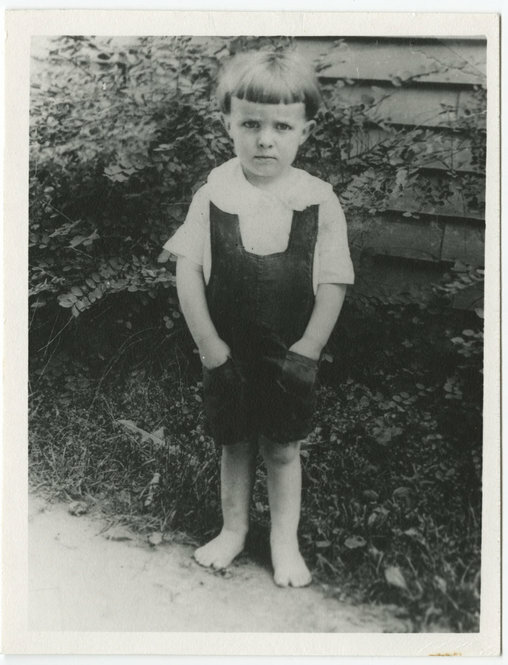 In this letter to his editor Nancy Nicholas, Bradbury, who was working on his autobiography “Dandelion Wine,” included a picture of himself at the age of three. 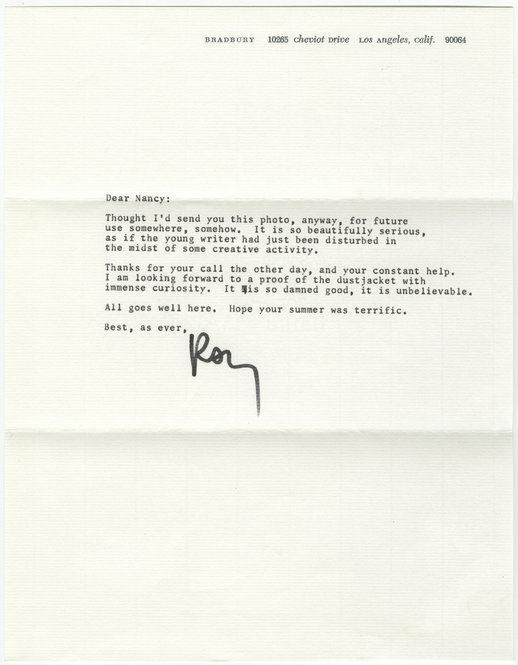 He jocularly describes the photograph as “beautifully serious, as if the young writer had just been disturbed in the midst of some creative activity.” The Ransom Center’s Alfred A. Knopf archive houses extensive correspondence between Bradbury and editors at Knopf, as well as the original reader’s report that encouraged rejecting Bradbury’s work in 1948. 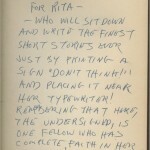 Alfred A. Knopf collection. 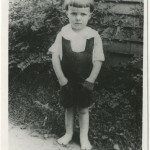 A photograph of Ray Bradbury, age three. Bradbury spent most of his childhood in Waukegan, Illinois, a small community on the western shore of Lake Michigan. Waukegan became the model for the “Green Town” that was the setting for many of his stories. As a boy Bradbury enjoyed fairy tales, horror movies, traveling carnivals, and visiting the local public library, and aspects of each of these interests would influence his later books and characters. Alfred A. Knopf collection. 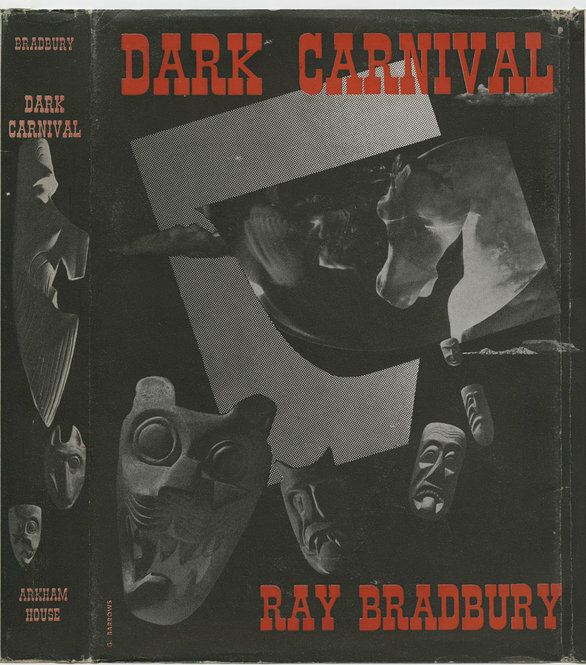 After being rejected by Alfred A. Knopf, Ray Bradbury’s first novel, “Dark Carnival,” was published by Arkham House, a press associated with H.P. Lovecraft and his circle of fellow science fiction writers. 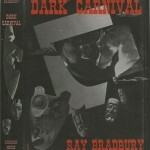 “Dark Carnival” was printed as a limited edition of only 3,000 copies, making first editions of the novel some of the most rare books in the history of sci-fi literature. Ellery Queen book collection. 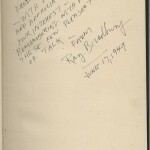 The Ransom Center’s copy of “Dark Carnival” is inscribed by Bradbury to Frederic Dannay, who wrote mystery novels under the pseudonym Ellery Queen. 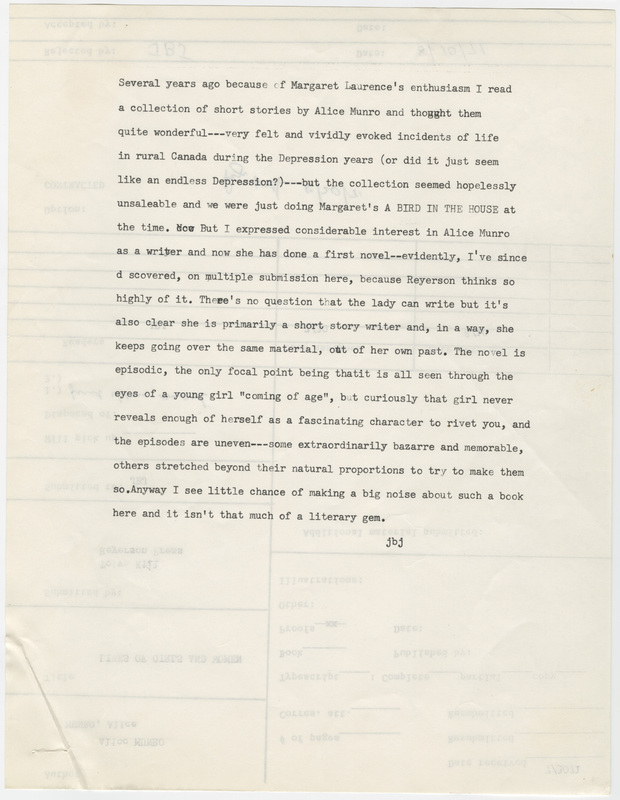 Dannay was an early supporter of Bradbury, as well as an avid book collector, and multiple copies of Bradbury’s works are found in the extensive Ellery Queen book collection at the Ransom Center.